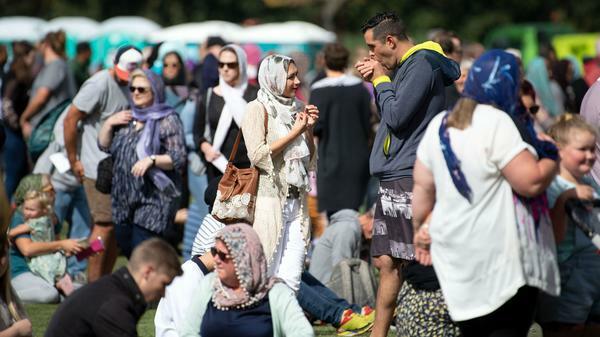 Women wore headscarves as they gathered for the Muslim call to prayer in Hagley Park in Christchurch on Friday. The call was broadcast across New Zealand in memory of 50 people who were killed in attacks at two mosques last Friday. Prime Minister Jacinda Ardern and other New Zealanders packed a public park in Christchurch on Friday to listen to the Muslim call to prayer one week after a gunman attacked two mosques, killing 50 people. The call to prayer was broadcast nationwide and was followed by two minutes of silence. Ardern led mourners at Hagley Park adjacent to the Al Noor Mosque where most of the victims were slain. The mosque itself remains closed for renovations but is scheduled to reopen next week. "New Zealand mourns with you, we are one," Ardern told the gathering. "This terrorist sought to tear our nation apart with an evil ideology ... but we have shown that New Zealand is unbreakable," the imam of the Al Noor mosque, Gamal Fouda, said in thanking New Zealanders for their support and compassion since the attacks. "We are brokenhearted, but we are not broken." 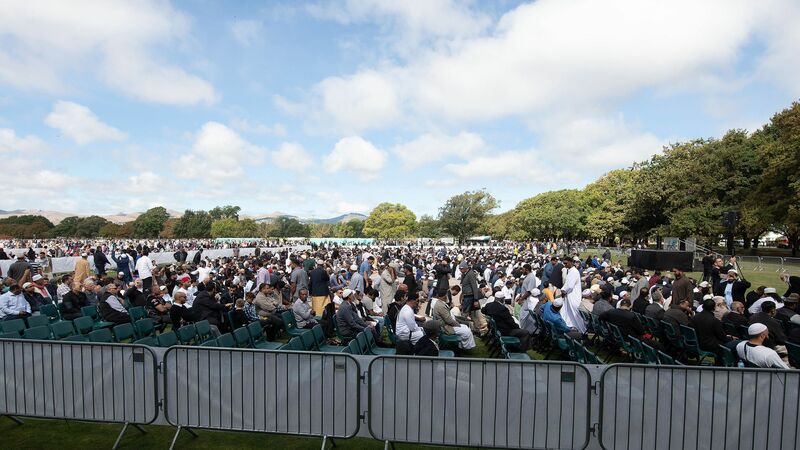 People listen to the call for prayer in Hagley Park in Christchurch, New Zealand, on Friday in memory of the victim of shooting attacks at two mosques one week earlier. The one-week landmark came amid burials of victims and as Ardern's government moved swiftly to try to prevent another mass shooting. "Since Friday, Prime Minister Jacinda Ardern has worked tirelessly to coordinate a government effort to overhaul New Zealand's gun laws," NPR's Rob Schmitz reported on All Things Considered. "In the span of five days, her coalition government has formulated a ban on all the semi-automatic weapons that were used in the Christchurch attack. According to the law, New Zealanders are required to register online to set up a time to hand in their guns to police," he added. 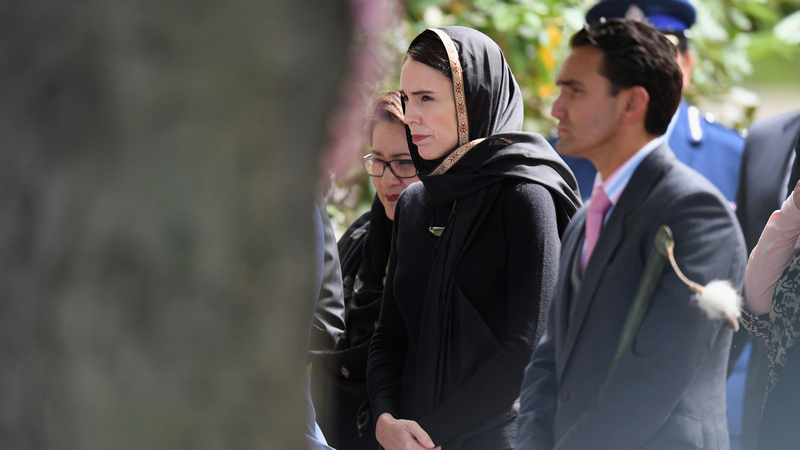 New Zealand Prime Minister Jacinda Ardern attends Muslim prayers in Hagley Park near Al Noor mosque on Friday. Fifty people were killed in shooting attacks last Friday, most of them at Al Noor in Christchurch. Others were at the city's Linwood mosque. Ardern said the government won't penalize anyone turning in guns within a set time frame, NPR's Barbara Campbell reported. "She said the government will create a buy-back program to pay owners 'fair and reasonable compensation,' which she estimated could cost the country between $100 million and $200 million. She said the guns will eventually be destroyed," Campbell added. Ardern wore a headscarf, as did many other non-Muslim women at the event. The prime minister has won widespread praise for donning a black scarf when she met with families of the shooting victims soon after the attacks. Since then, other non-Muslim women in New Zealand have worn headscarves in a sign of support and solidarity.